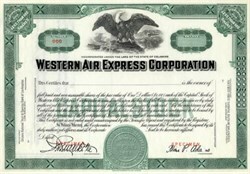 Beautifully engraved RARE SPECIMEN certificate from the Western Air Express Corporation. 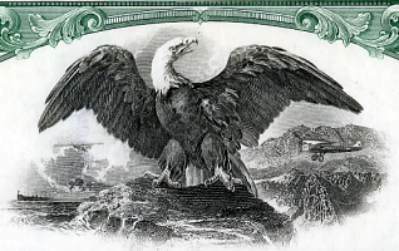 This historic document was printed by the Jeffries Banknote Company and has an ornate border around it with a vignette of an eagle perched upon a rock that is sitting in the middle of the water. This item has the printed signatures of the Company's President ( A. P. Adams ) and Secretary. This is the first time we have had this certificate for sale. Western Air Express was formed in July 1925 with six Douglas M-2 mailplanes and 20 employees. The airline provided mail and passenger service in 1926 from Los Angeles to Salt Lake City via Las Vegas. The carrier depended upon its mail routes for revenue and fell on hard times when it began passenger-only routes. In 1930, Western Air Express agreed to merge with Transcontinental Air Transport, forming Transcontinental and Western Air Inc. (TWA). The deal later fell apart. Western Air Express was revived and, in 1940, signed its first ALPA contract. In 1941, the carrier became Western Airlines.